The lead up to this game played out like a tragedy as player after starting player fell to injury. It was as if a Sharknado had hit our starting eleven. I know I was dreading kickoff, and more nervous than I’d been in a while for any game. But as I pointed out in my match preview, this is when Allegri shines. Somehow, he gets the most out of his provincial players in an injury crisis, he almost always gets the tactics right. If I didn’t know any better, I’d encourage him to apply for a position as the head of an emergency organization like FEMA here in the US, he is so good at these crisis situations. 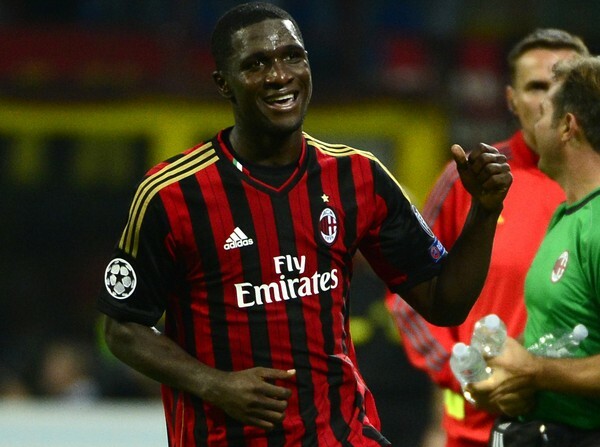 He is an unlikely hero that way, one of many today who gave Milan the win and the precious three points. After very little sleep and a lot of anxiety, Milan came out defending. Ironic how many people have clamored for an improved defense from Milan for so long, and how so many of them were disappointed by the defensive style of play tonight. The same style of play that got us the clean sheet. But we met Celtic at their game and beat them at it. And while meeting the other team’s playing style and level is not ideal, it worked tonight. With the current Injury Armageddon™, it’s a forgivable offense for me. A year or two from now, the bad taste in our mouths from this match will have been wiped clean, but the score will be in the history books forever. A few things were clear right away. Matri is not worth even half of his transfer fee, passing balls to the keeper as if there were someone playing in front of him (there wasn’t anyone.) And there is a reason Birsa wears the no. 10 for Slovenia. Despite being played out of position, the guy was making beautiful crosses, runs on goal, and was overall quite impressive. Maybe he doesn’t start every game, but great to know he’s on our team. And Balotelli is so much more effective in the center up front, rather than playing out wide like tonight, or deep like he has had to lately, even if he was involved in both goals in this game. Then there was a very strange call by the ref. in the 17th minute, he gave Celtic an indirect free kick. In the 6 yd. box. The Celtic player took the shot, Abbiati reached to save it, which the ref apparently deemed "controlling" the ball with his hand. Then he he picked it up. So the ref said it was a foul for touching the ball twice. Picky German ref. I have never seen that called before. Whatever. It gave Constant the chance to block the ensuing shot almost point blank, like a boss. Both teams traded shots, but to no avail. In all, Milan had 19 shots, 12 of them on target. That is pretty darned good. Particularly in comparison to Celtic’s 11 shots, 5 on target. And also considering they are no lower Serie A team like Torino or Verona, they were a worthy Champions League opponent. So when I say we beat them at their own game, I mean it quite literally. Milan were especially frustrating for Celtic in the first half, whereas in the second half, it was clear everyone was tired, but it seemed like Celtic saw a few more chances later in the game. The second half saw substitutions, yellow cards, and goals. Allegri started early, bringing on Emanuelson for Birsa in the 63rd. Then Robinho on for Constant in the 76th, and finally Poli on for Matri in the 87th. I honestly think Allegri did well with these substitutions, both in timing and personnel-wise. Well, and honestly, who else would he have brought on? The cards were all on Celtic, they had 3 yellow cards in all, that’s how they apparently showed they were tired. Well that, and the 17 fouls they were called for, as compared to our 10. But it was the goals that were really amazing. What better way to cap off such a defensively played match than for a defender to score? In the 82nd, Balotelli sent the ball back to the middle where Zapata was open, and he let it rip, with a little deflection help from Emilio. 1-0 Milan. 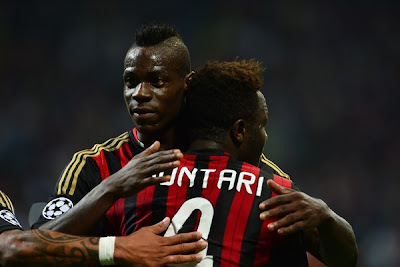 Then, in the 86th, on a Balotelli free kick which saw Balotelli almost break Forster’s arm with the parry, Muntari was there to clean up the rebound. 2-0 Milan. Were the goals lucky? Of course, aren’t most goals, really? But considering the sheer number of chances Milan created, no matter how ugly, and the fact that Celtic’s best effort was probably the 80th minute shot that Stoke put right on the top of the crossbar, I’d give a little more credit to our unlikely heroes of Zapata and Muntari. Was this Milan’s finest hour? You might say no. But I beg to differ. It was a horrible crisis, and they rallied around and played with pure heart (because the talent was a little bit lacking, to be honest.) Against every odd, they played as a team and they played with grinta. And at the end of 90 minutes, they came out on top. Well done, Milan. Take a bow. It wasn't pretty, but you made it happen. Epic. The time to criticize management for having such a poor squad when injuries hit really was in the summer, when something could have been done about it. The time to criticize Allegri is pretty much every other day. The time to talk about style of play, who should play where, whether or not this team is worthy of the Milan shirt… that time is another day. Tonight, my hat is off to Allegri and our boys for doing what everyone considered impossible. Tonight we celebrate the victory of the human spirit, the ability to overcome every odd. The ability to reach deep down inside and find even the tiniest bit of that Milan Champions League DNA. Just enough to squeeze out a victory with the most unlikely of heroes. Well done Allegri. Well done, boys.